“Rust Belt” has become the term used to describe the post-industrial heartland of the northeastern US, where declining population and rising poverty have created a new wasteland. I have an affection for all things old and weathered. I am also an avid technologist and a futurist. 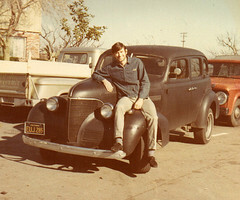 This 1952 Studebaker is permanently parked behind the old Leatherock Hotel in Cherryvale, Kansas. Five decades ago, South Bend, Indiana began its decline when the last Studebaker rolled off the assembly line. The fall of Detroit had already started and later went further and deeper. San Francisco in the 1970s-1990s was a playground for the Suicide Club and the Cacophony Society. You could work a part-time job to cover food and rent, and still have plenty of time left over to explore abandoned buildings and develop all kinds of silly ideas, like for instance; BurningMan. It may be that we were the first hipsters, but we were not pretentious. We shopped in thrift stores because we had to. We created our own style. 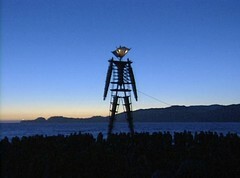 BurningMan began on a beach in San Francisco in 1986. The tech boom was just beginning when we moved the burn to the Nevada desert in 1990. After the first San Francisco tech bubble burst, BurningMan was finally able to afford an office in the south of Market area. We were like tiny, nimble mammals feasting on the bones of dinosaurs during the die-off. Over the years, we’ve evolved into a 500-pound primate, able to hold our own with the big boys. In 1997, container Zero was the first first shipping container I acquired for use at BurningMan. It was the beginning of containerized transport for the organization. During the next decade, most of the major playa art projects were produced out of shipping container artist workshops that took root in the industrial wastelands of the the Bay Area: The Shipyard, The Boxshop, American Steel and NIMBY. In recent years, The Generator warehouse space in Reno has also began to contribute major artworks. The industrial cities of the American heartland came into existence as economic entities because of three components; raw materials (such as Precambrian iron ore deposits), fuel (coal from the Appalachian Mountains) and transportation (railroads & Great Lakes shipping). The decline came when these manufacturing resources shifted to a more global model. Evolution is now beginning to favor a new kind of animal that can exist and thrive in the rust belt wastelands. Rust Belt Revival describes re-use of old urban landscapes, an architectural style and an artistic aesthetic. Former printing plant becomes artist studios. Rust belt buildings find new uses. Here is the Cleveland Art studio. The Cleveland Art storage yard is filled with raw materials. Old steel is a raw material for many artists. American Steel Studios has acquired portions of the old SF Bay Bridge for use in art projects. Old wood from factory floors. Rustic tables made from old factory wood. Old Redwood Singer table by Zac Carroll. Recycled table by Jason Wein. A collection of recycled industrial materials. Artists will continue to find new business niches in the Rust Belt making use of old materials and novel use of new materials. Low cost housing and walkable city centers will attract even more new inhabitants.